Carlisle 6" Cover Tape is a nominal is used in applications that require a cured membrane to cured membrane seam. Carlisle 6" Cover Tape is ideal for stripping in seams, metal edge details (flat), or simply repairs to cut membrane. The cured state of the EPDM membrane enables it to handle expansion and contraction loads without weakening and allows it to resist tearing, flex cracking, and abrasion and other forms of deterioration caused by temperature extremes, sunlight, precipitation, and all forms of normal weathering. 1. The entire surface where the Econo Cover Tape will be applied must be clean. The adhesive on the back of the Cover Tape will not adhere to dusted/dirty surfaces. Any residual contamination will be detrimental to the bond strength of the adhesive. 2. Remove all foreign material. a. Remove excess mica dust by brooming or wiping with a clean, dry rag. b. The use of Membrane Cleaner may be necessary. This process is essential on membrane that has been exposed for a number of weeks. Note: Permeation-resistant gloves (that meet ANSI/ ISEA 105-2005) are required for hand protection when cleaners or primers are being used. c. Allow the membrane to dry thoroughly before proceeding. 3. Application of EPDM Primer: a. Standard Membrane: Apply the primer using a clean rag. Scrub the area of the membrane where the Cover Tape is to be applied in a circular motion to achieve a thin, even coating on the membrane. The properly cleaned/primed area will be uniform in color without streaks and free of globs or puddles. b. No-Dust Membrane: Roller-apply the primer to the membrane with a short nap-length paint roller. The coated area will be free of globs or puddles. Note: The use of excessive amounts of primer will not signifi cantly enhance the adhesion of the Peel & Stick product to the EPDM membrane. Use only the amount necessary to obtain 100% coverage of the area where the Cover Tape will be applied. 4. Allow the primer to fl ash off until it does not transfer to a dry finger touch yet remains tacky. Install Cover Tape immediately after the primer has fl ashed off to promote adhesion and avoid contamination. 5. Peel off 10-12" (250-305 mm) of the protective release liner from the Cover Tape. Position the cured cover tape over the area to be covered and press down the exposed tape adhesive using fi rm, even hand pressure across the entire area. Continue this process until the full area to be fl ashed is completed. 6. 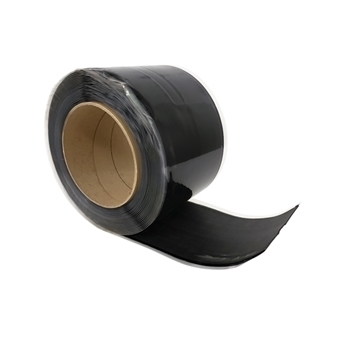 Immediately roll the Cover Tape with a 2"-wide (50 mm) roller. Roll across the cover strip edge, not parallel to it. 8. To achieve proper adhesion of the Econo Cover Tape when jobsite temperatures fall below 40ºF (4ºC), heat the primed area of the membrane with a hot-air gun as the fl ashing is applied and pressed into place.